I figured it was HIGH TIME I gave you some proper pizza now that it’s April. Not that anytime before April is a bad time for pizza. Gosh naw. I just mean that I’ve not posted or talked about pizza in months and months, and it’s like, WHO AM I. The sun is out. The grass is green. The trees are budding. It’s time for pizza. 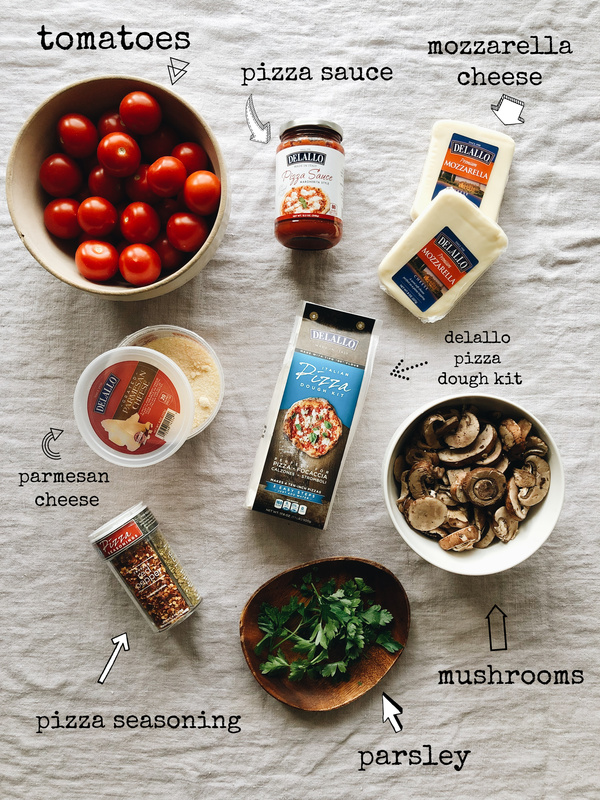 And this one is unbelievable because it involves slow roasted tomatoes (hello, yes), sautéed mushrooms (never a bad idea), aaaaand a fancy little array of DeLallo pizza products! You know how you see the little pizza dough kit at the store and you’re always like, “I wonder how that is.” Well guess what pigeons, I’m gonna show ya. Today right now. So look at everything that DeLallo carries pizza related. The seasoning (four flavors! ), grated parmesan cheese, mozzarella cheese, pizza sauce, the dough kit. Who knew! I had no idea. Did you? No you did not. 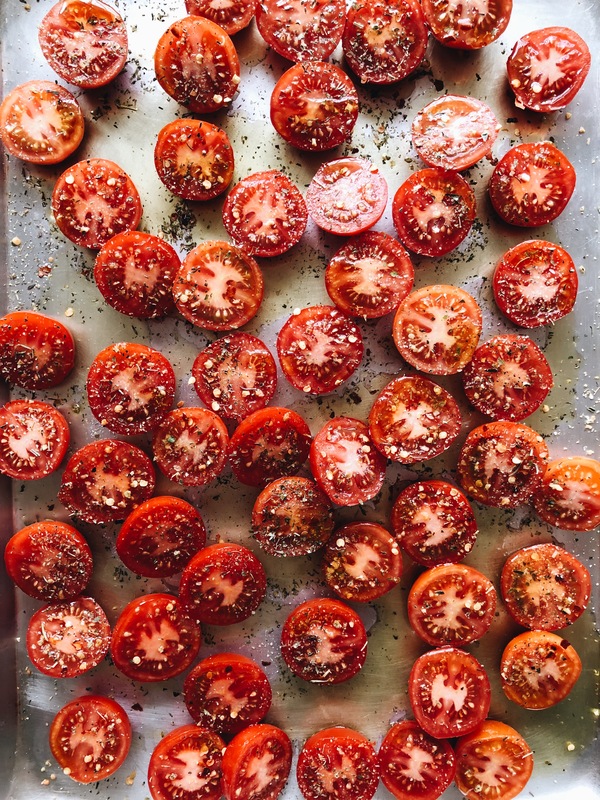 So we’re gonna roast some tomatoes. Slow roast them. For literally three hours. So it takes a while. But it’s so supercalifragilisdflskhfkwlhfdsldf worth it in the end. ALSO, I took the DeLallo pizza seasoning and sprinkled on a little of each kind. 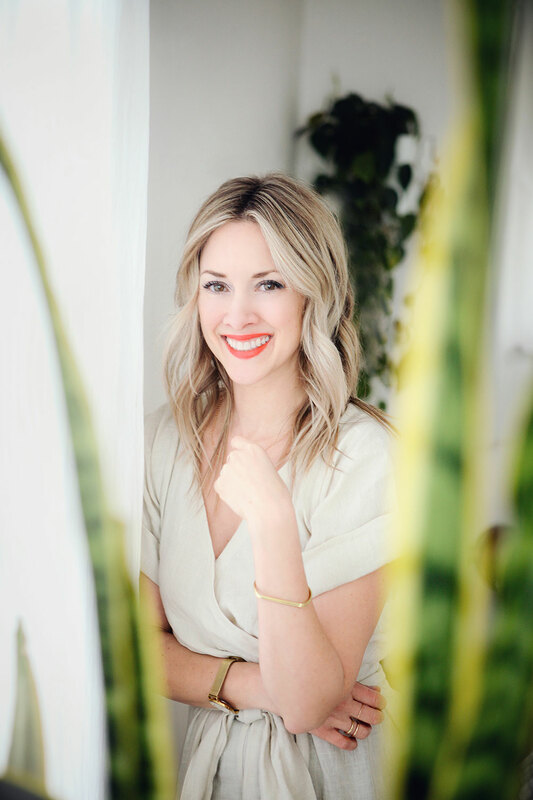 You can absolutely tailor it here and choose what you want. But I surrendered my soul and went in all willy nilly. Crushed red pepper, roasted garlic and cheese seasoning, Italian seasoning, and the zesty garlic and onion. Freaking brilliant. Just SPRANKLE everything on those sliced tomatoes. Would you look at that right now? Little umami bombs right there. If you chose to stop for a second and place one on a cracker with parmesan cheese on top, you would not be in trouble with me. So in the meantime, you’re gonna use the pizza dough kit and start your dough! It’s that fancy “00” flour, you guys. So you know it’s already better than any other pizza. It looks shaggy in the beginning, but you knead it a few minutes and it becomes this silky mound of yeast bliss. Let it sit for a bit! I know the instructions call for 45 minutes, but I let it go a bit longer because I was distracted with laundry and snacking on the roasted tomatoes oops. 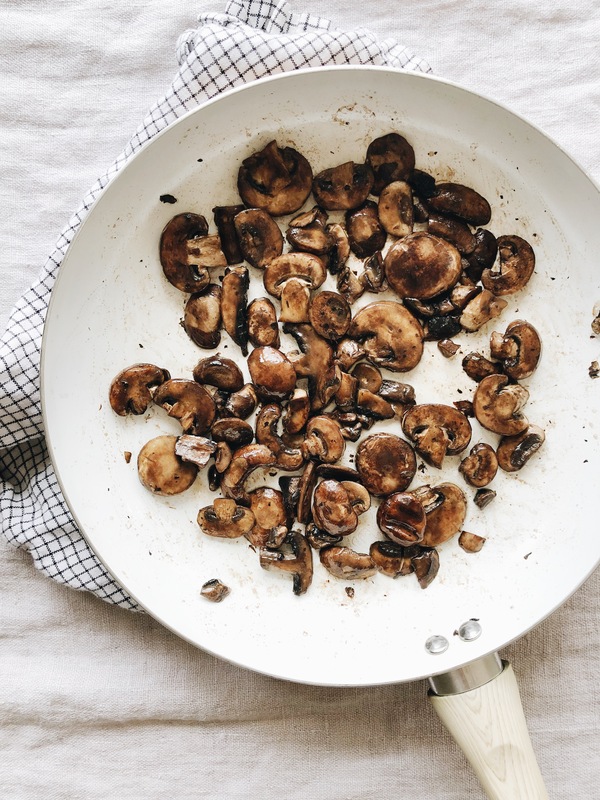 Also, get some sliced ‘shrooms all sautéed. And you know what, some people like raw mushrooms on pizza, which is fine! The baking will do some work on them. If you want to save a step, go git with ya bad self. I just prefer the depth of sautéing. And to say things like depth of sautéing. 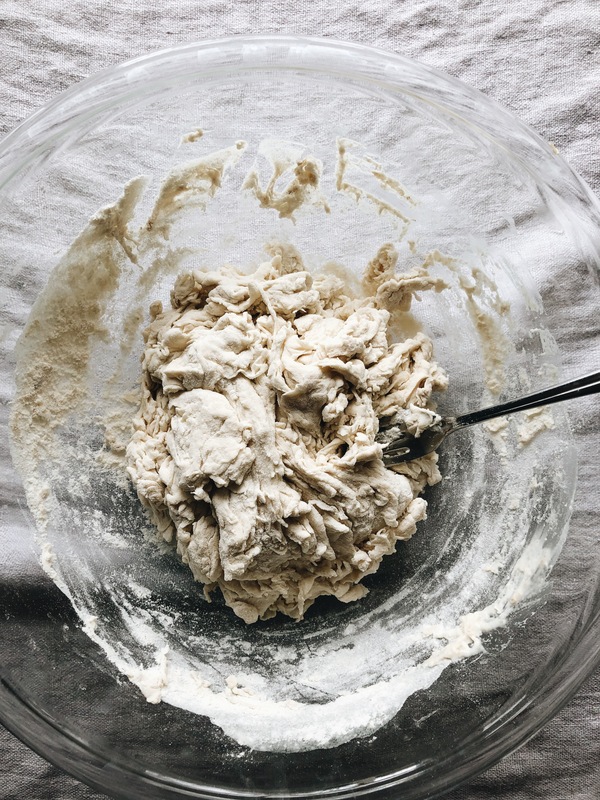 The dough – SO EASY to roll out. You almost won’t need a rolling pin! That “00” flour is crazy. Everything just pulled and pressed and wiggled and stayed in place. 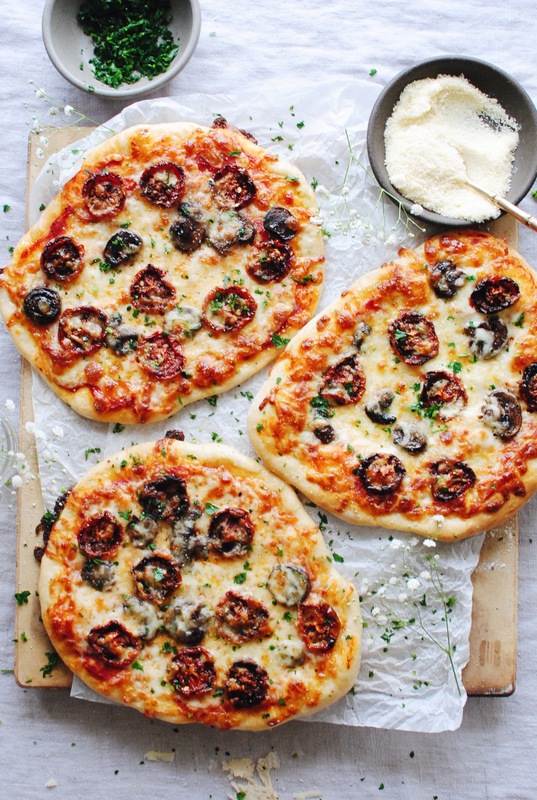 Just like you want pizza dough to do. On went a little sauce, some tomatoes, mushrooms, and shredded mozzarella cheese. Which um, is creamier than other mozzarellas I’ve had before. I don’t know what’s in the cheese to make it so dreamy creamy, but I’m nominating it for president. THESE WERE UNREAL. And they only took like 12-15 minutes in a hot hot hot oven. The crust is PERFECTLY billowy in places, crispy in others, and has that rustic yeast flavor that makes you weepy in the soul. I was able to get four almost-10 inch pizzas out of this one mound, which was perfect for our crew. I could have rolled them out thinner for sure, but I like that slightly wonky, puffy pocket look in smaller, rustic pizzas. Know what I mean, Vern? 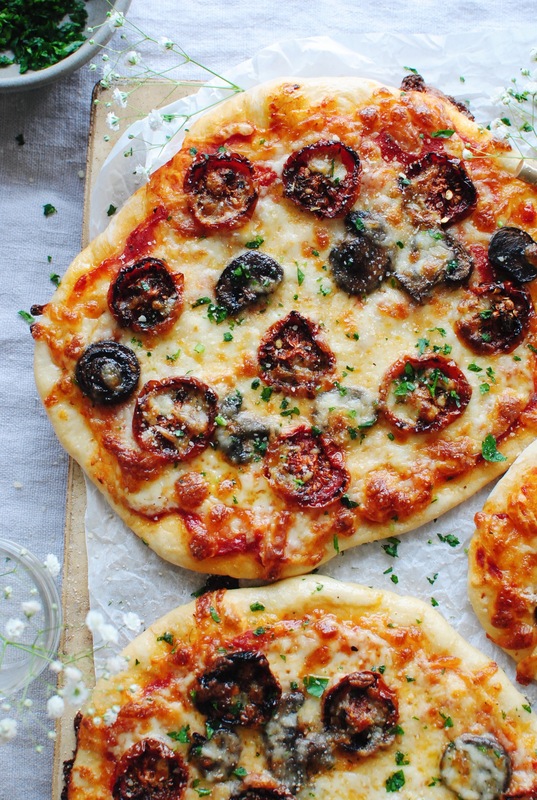 In short, completely falling apart over these pizzas. 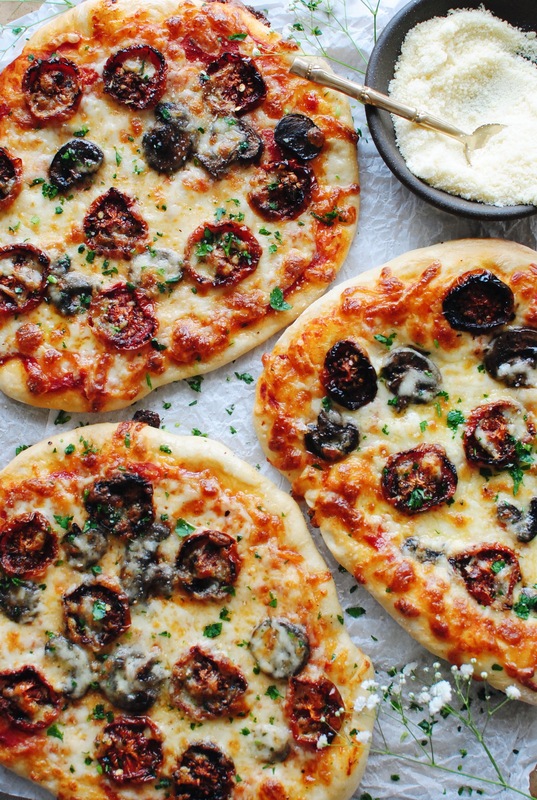 The pizza dough kit made it beyond easy to pull together. And oh! The pizza SAUCE. Bright, acidic, tomato-y, perfection. Especially since the roasted tomatoes were on top, carrying the deeper flavors guuuuuuuuh. Freaking divine. Preheat oven to 350. Place the sliced tomatoes on a roasting pan, and sprinkle the DeLallo pizza seasoning over the tops. There are four different seasoning choices, so obviously I chose all of them. Do what you want here! Pour the oil over the tomatoes and roast for three hours. 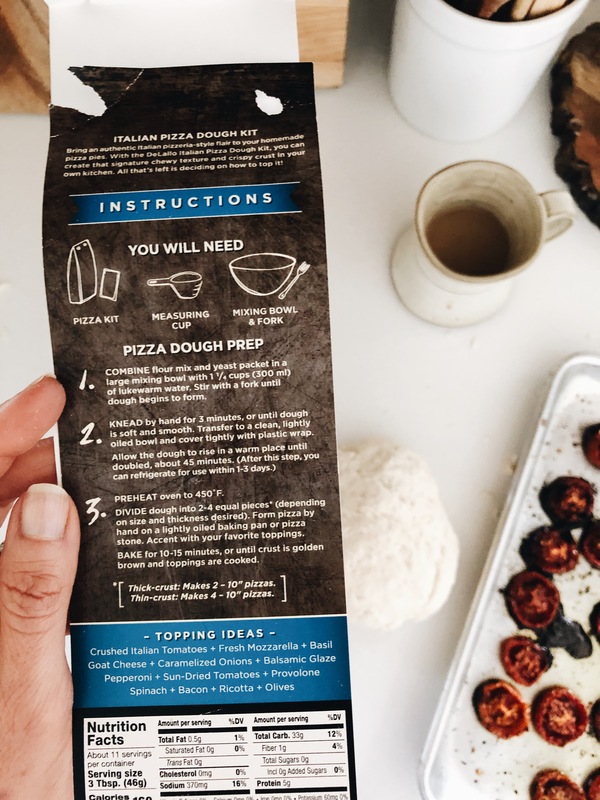 In the meantime, follow the simple instructions on the DeLallo pizza dough kit. Let the dough rest anywhere from 45 minutes up to a couple of hours. I went longer so it would rise more. Then divide the dough into four smaller mounds. Roll them out to make 8-10-inch pizzas. Flip the oven to 450, and start prepping your pizzas. 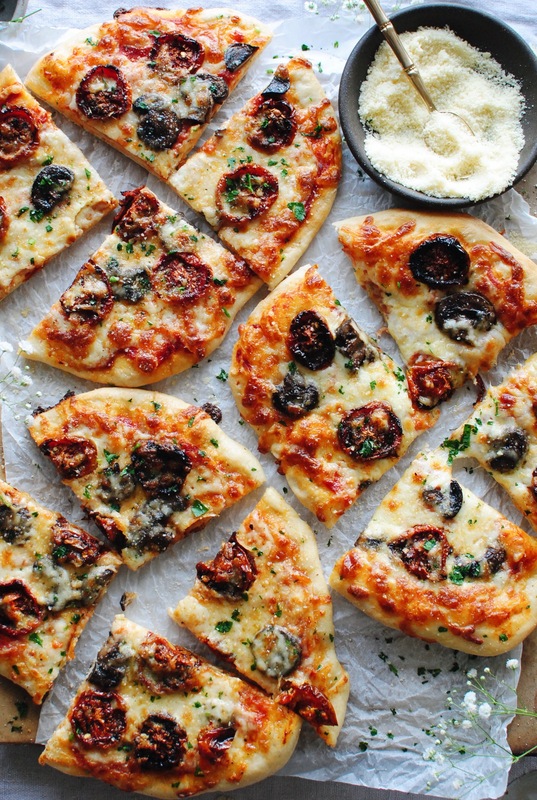 Spoon some sauce over each crust, along with the slow-roasted tomatoes, sautéed mushrooms and shredded mozzarella cheese. 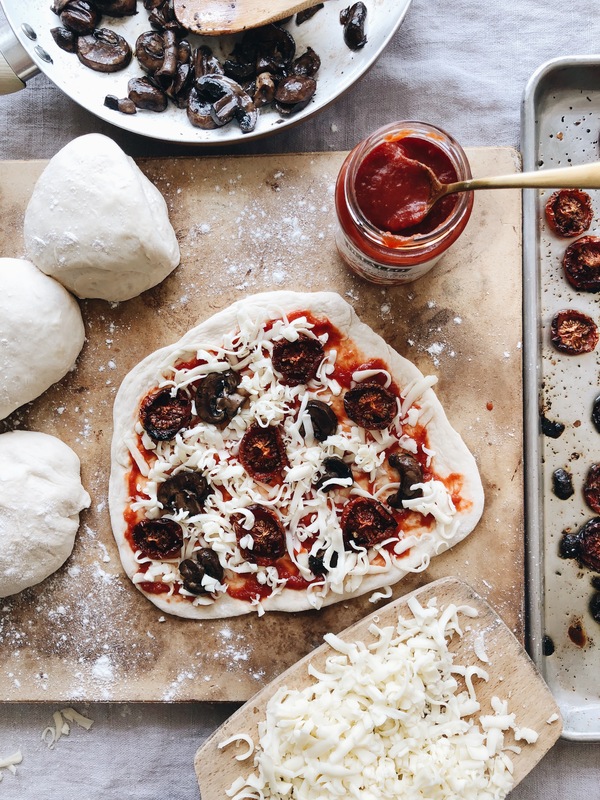 Bake each pizza on a pizza stone or large baking sheet flipped over, anywhere from 12-15 minutes, until the cheese is browning and bubbling. Perfection. 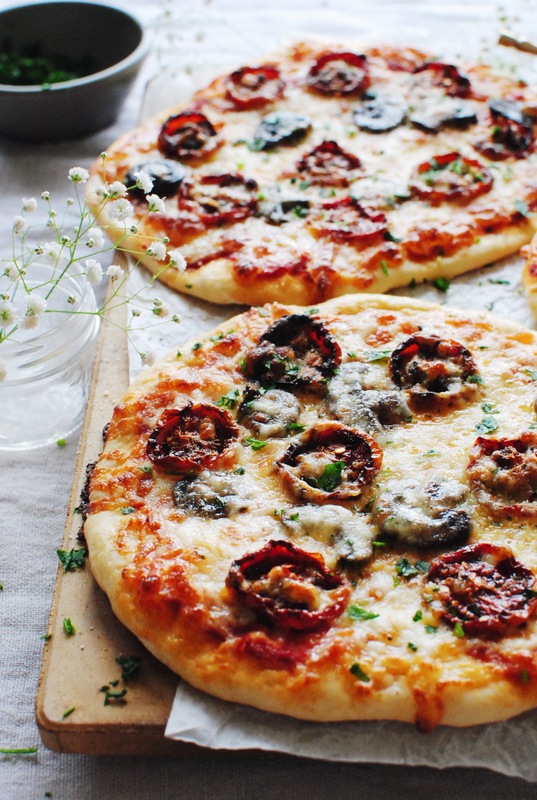 Garnish each pizza with freshly minced parsley and parmesan cheese and dive in! Still can’t feel my face. I am so excited about this pizza. I love mushrooms, and I have become obsessed with slow roasted tomatoes since your post about Creamy Roasted Tomato Soup from a few months ago. I made that soup on a chilly February day, and my kitchen smelled AWESOME. Oh, the soup tasted amazing, too. 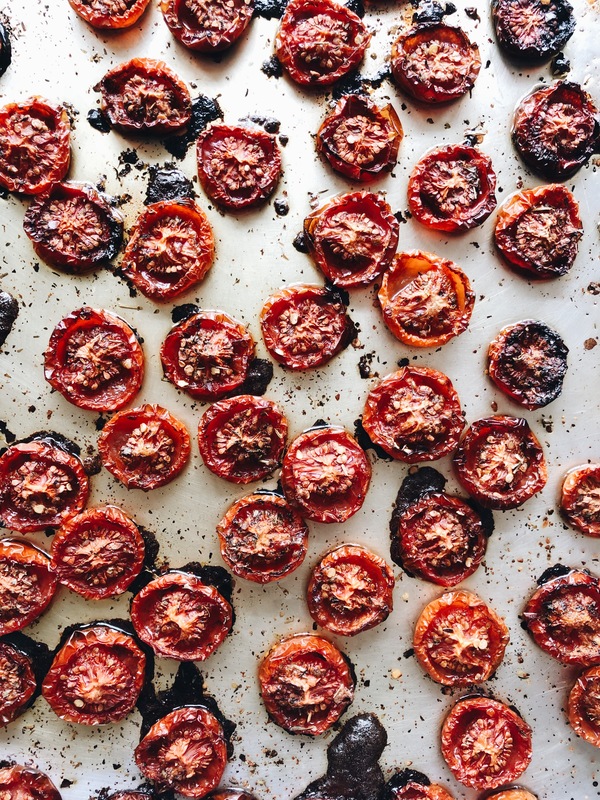 So, I am a full believer in slow roasting tomatoes these days. Will have to try this pizza with them now! Not really! Just a little sos pad. :) But you can use parchment paper if you like! I'm definitely going to make this. I need to find all those yummy ingredients here in calli first. And you know what? I found doing tomatoes in the air fryer has really amazing results in a much shorter time, so good. And I adore dill havarti. Drooling over this! Perfection. I always order their pizza dough kit and sauce directly from their site. And many other goodies! Yesssss, it's all so good!